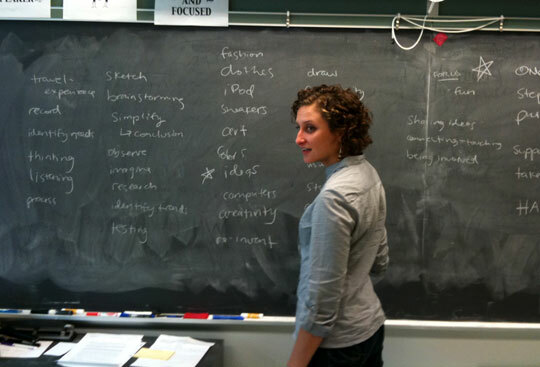 September 30th, 2010 by Katie Koch | Filed under Curriculum, Teaching. We arrived at the UA Institute yesterday at 2:30pm, just moments before we would meet our first group of students. We were mostly prepared, but had spent some of the day texting and emailing each other to coordinate logistics. I was a little nervous heading there, until I ran into the school’s development director, Mara. She was reassuring and helped us get set up in the room before we headed down to the cafeteria to meet the girls. The students have a scheduled snack time for about 20 minutes between the end of their day and the beginning of after school activities. It was a really great opportunity for us to meet them in an informal setting and get to find out some things about them while they’re still candid and one-on-one. One of our students told me about her old high school, from which she had just transferred, and how one of the best parts about UAI is that the bathrooms are cleaner and there are no boys to stink everything up. I guess it’s the little things! When we got to class our first challenge was taking attendance. I’ve spent my whole life correcting teachers during this activity (my name shows up on rosters as Kathryn Koch, usually mispronounced as “kotch” instead of “coke”). As I tried to read the first few names on my list I had a fleeting moment of those memories and suddenly empathized with every substitute teacher I’ve ever had. We started our class by talking about a familiar object – an iPod – and the qualities of it that help us know what it’s used for. These girls are sharp!! Right away they were able to identify the two ports as a clue that it has power and connectivity, and could identify the play, pause and headphone icons as indicators of the media associated with the iPod. Many of them pointed to the screen as evidence that we might be able to see a moving image, and the forward and back arrows as indicators that there is more than one thing that the device does, possibly in sequence. They called out the back of the iPod being a mirror for checking their hair and makeup, a function probably not intended by Jonathan Ive. We then handed out images of objects for them to write about, including scissors, a chess set, a hammer and a digital alarm clock. We gave them some time to write their ideas down and then moved on to introductions, telling them about us, the program and our expectations. We were so excited to give out notebooks to the girls! 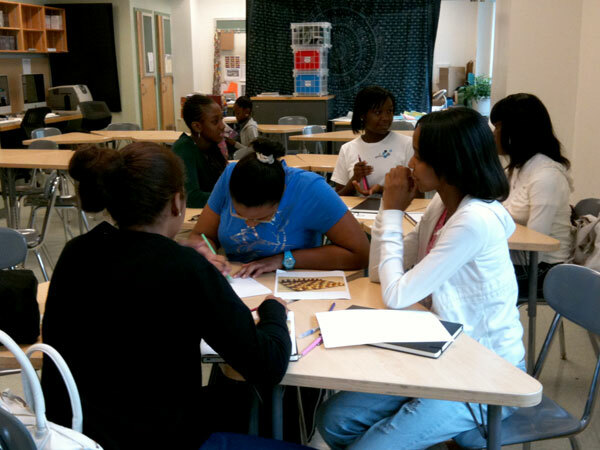 For being part of the program each girl has her own Moleskine Folio notebook to sketch, doodle and write in. We encouraged them to use the sketch books as much as possible and for any purpose they see fit. We expect they’ll find ways to capture their thoughts that are beyond our hopes for them. Lecture: What is design? What is interaction? For the rest of class we led a group discussion centered around defining the concepts of “design” and “interaction.” I volunteered to lead the lecture, and it was thoroughly exhilarating! The girls started by naming anything they could think of that represents design to them: fashion, clothes, sneakers, art, colors, ideas, computers, creativity, drawing, community, style, entertainment. Then we named the things designers do: sketch, brainstorm, simplify, observe, imagine, research, identify needs, test, record, think, listen. We encouraged them to practice all of these skills during our class and in their other classes. Defining the idea of “interaction” was surprisingly easy with this group. We first introduced the idea of a feedback loop by demonstrating an action and reaction. I asked them what happens when they swipe their MetroCard. Every girl in the room could shout out a different piece of feedback that comes out of the turn style: a beep, a green light, the word Go, a message telling you how much money is left on the card, and the sound of the turn style unlocking. Through this example they instantly understood what feedback is, and how this experience is defined as an interaction with a machine. It was pretty amazing. Suddenly class time was almost over! Mara gave us the five minute warning so quickly put the girls in their groups to come up with a team name and logo. They had a lot of fun coming up with a creative name and getting draw and color in their logos. It was a great, familiar way to end class. We gave them all their own INVENT DESIGN CHANGE buttons and sent them home! The things that worked really well were having the girls start the class with a quiet, individual activity. It was a great way to reduce the chaos of the first day of class and get them comfortable with talking about some of the stuff we’re teaching. The lecture portion was great, too! We were a little worried about making them sit still for so long, but they seemed entirely engaged in coming up with a definition for interaction design. We quickly discovered that high school girls are more interested in talking about television and music than about the designed characteristics of a chess board. Next week we will be better at keeping side conversation to a minimum. As with any class, there are a few students who aren’t interested in participating in every activity. It’s okay if those students aren’t shouting out every answer, but we want to make sure they’re still paying attention. How can we engage each and every student on a level that’s appropriate for them, knowing that not every person in our class is enthusiastic and outgoing? One of my favorite parts of the class were the introductions. We asked each girl to tell us their name, grade and one thing they were passionate about. The responses included cooking, dance, fashion, business, and technology. What was exciting about this moment in class was that all the girls were really curious about each other with a genuine interest in getting to know their classmates. Can’t wait for week 2!